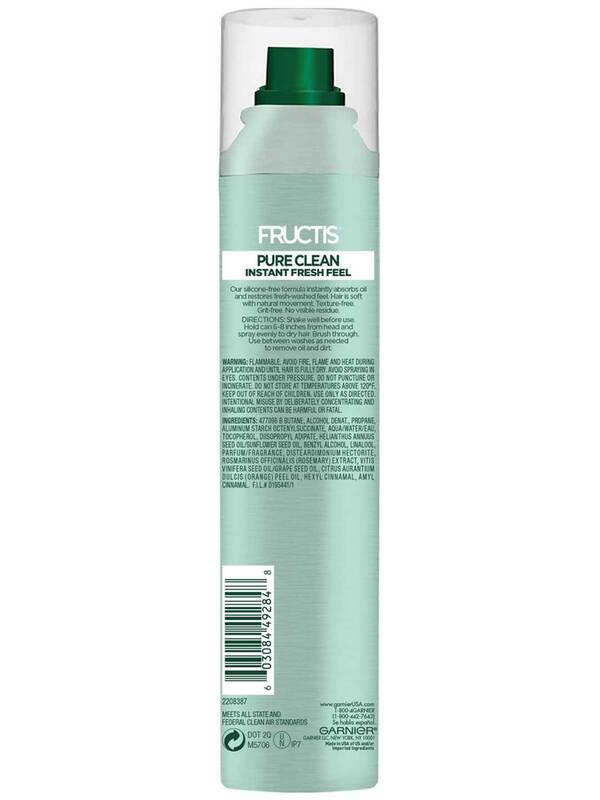 Garnier® Fructis® Style Pure Clean Dry Shampoo is a silicone-free dry shampoo for normal to oily hair that instantly absorbs oil and restores a fresh-washed feel. Hair is soft with natural movement. Texture-free. Grit-free. No visible residue. Shake well before use. Hold can 6-8 inches from head and spray evenly to dry hair. Brush through. Use between washes as needed to remove dirt & oil. Rated 2 out of 5 by Mfree from Disappointing I bought this after using garnier fructis volume extend dry shampoo for years, thinking how wonderful "no residue" sounded! Not only does it still leave a visible reisdue (although not as much as the other product), my hair looked just as oily as before using it. It does smell nice, but if looking for a product to buy you an extra day between washings, this just isn't it. I was really disappointed and wish the volume extend was still available. Rated 1 out of 5 by Dlp92 from Awful! Let me start by saying I VERY rarely write reviews but I felt I needed to save others from buying this horrible product. I feel like I’m just spraying a can of air into my head. This does absolutely nothing that it’s supposed to do. There’s no volume and no oil absorption. By far the worst dry shampoo I have ever tried. I hate being a negative Nancy, but this product just is not for me and I think you should think twice before you give it a try. Rated 1 out of 5 by Maran from Waste of money This is one of the worst products. It doesn't have the purpose it is intended to. I put it and hair still looks oily. It does not help a thing. Honestly, buy Basta if you want good dry shampoo. Rated 4 out of 5 by KCeicys from Just one more day.... I have THICK hair. The type of hair that isn't curly, a little wavy, but absolutely need to blow dry or straighten it if I want to look like a real human. It takes me close to an hour if I give myself a blowout so I want that hair to last as looooonnngggg as possible! Enter dry shampoo. I've used over a dozen different brands all with the same purpose, give me one more day between washes and DON'T give my brow hair the dreaded "dusty" look. 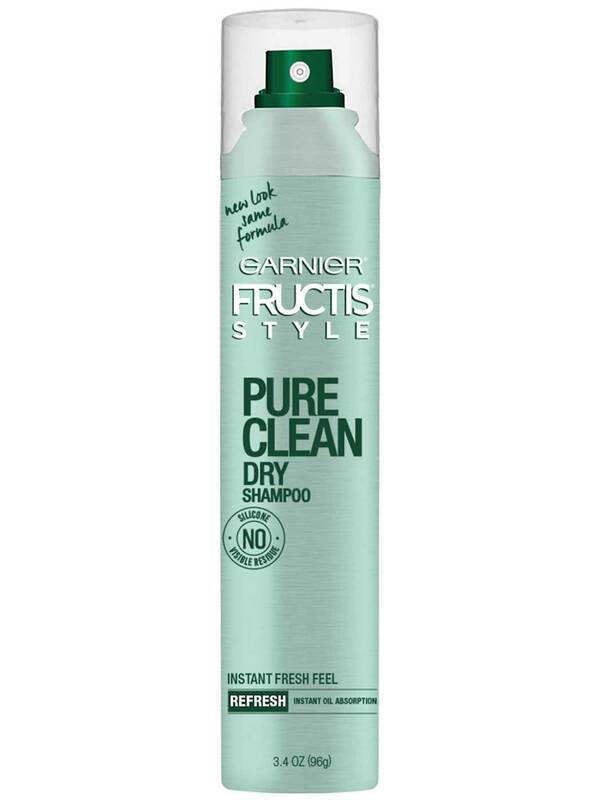 Garnier Fructis Style Pure Clean dry shampoo fits the bill. I love the even application, the smell pleases the nose, and you don't feel like you put your head in a chemical cloud. I found the best application is to spray on, let set, then work with your fingers to evenly distribute product. Unlike others, I didn't find success brushing the product after but a good hand tossel distributed product nicely. Rated 4 out of 5 by imcuriousasacat from Dry shampoo is not that bad This dry shampoo smells good and leaves my hair smelling fresh and clean for like a day but then it wears off. I guess it serves it's intended purpose. I would've given it 5 stars but I took off a star because it leaves white residue in my hair brush after I brush it through my hair. Odd though since at least the white residue is not visible in my hair, just my brush. Also another good thing is that when you spray it, it doesn't burn your eyes or face or scalp. Rated 4 out of 5 by dnhoangha from Good Dry Shampoo! 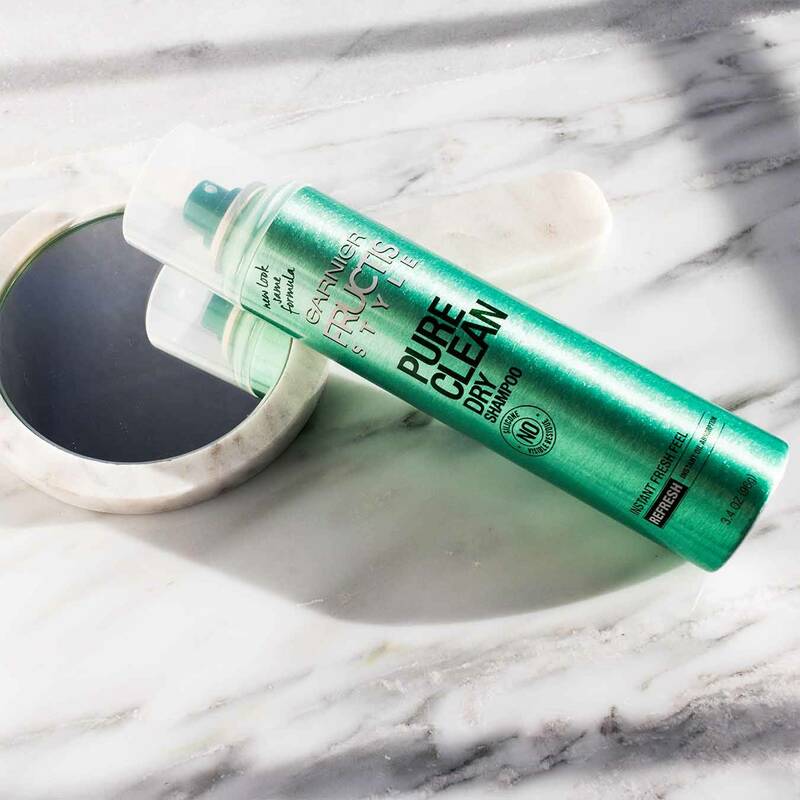 I'm always on the hunt for a good dry shampoo, so I was super excited to try out the Garnier Fructis Style Pure Clean Dry Shampoo. I only like to wash my hair every 2-3 days and this helped me look fresh in between those days. I have dark hair, and was scared I would get a white residue from this but it was completely invisible!! And the best thing is the scent. One star off because it does make my scalp feel a bit heavy, but as long as I'm not touching my hair often it looks good! Rated 4 out of 5 by nhperry from Pretty good! I’m so happy I found this product! The first thing I noticed when using this dry shampoo was how lovely it smells. It’s very easy to use and goes on nicely. It will color your hair a white-grayish color (until you brush it out) so be aware of that. The first time I used it for a few hours, and it left my hair looking clean and non-greasy. However, since then I’ve used it in my hair for only a few minutes before brushing it out, and it still leaves it looking clean and fresh. However, though your hair may look clean after using this product, I found my hair still felt a bit greasy. As long as no one is touching your hair and judging it should be fine though! Highly recommend to someone looking for a dry shampoo that’s easily available, affordable, smells delicious, and is very effective. Rated 4 out of 5 by saveourship from Great Budget Dry Shampoo I love this dry shampoo! It is a great budget option for those of us who do not want to spend 20-30 dollars on the fancy stuff. My favorite part is how light-weight it feels in my hair. I hate when I use dry shampoo and my hair feels heavy and full of gunk. This one didn't feel like that at all. It seriously felt like nothing in my hair. There were only 2 cons I found when using this product. 1. Be sure to shake it thoroughly! The first couple times I used it I didn't shake it enough and it barely worked at all. After shaking it for a minute though, I didn't have any problems. 2. I found that this dry shampoo is a little hard to rub into my hair than others I have tried. It just took a little bit longer to make sure I didn't leave any at the roots. All in all, I was really happy and would happily recommend this to anyone!